Upendo Mmoja, which means One Love in Kiswahili, is a small, growing community organization that is caring for about 18 children who are orphaned mostly due to HIV/AIDS. Upendo Mmoja was conceived and created by local Pommern community members with the assistance of their own university and post-secondary school graduates in Development and Business and USA supporters. Local community members serve on the Board of Directors. There is also a USA Support Team for Upendo Mmoja providing support and guidance led by Co-Founding member and Board Chair Nicole DiDomenico. Nicole DiDomenico is a Co-Founding member and Board Chair on the USA Support Team. Professionally, Nicole is the Director of Center for Civic Engagement at Norwich University in Vermont. She has traveled to Pommern for many years developing strong community ties and assisted the local community in starting Upendo Mmoja. She also ensures accounting for all the money donated and transferred to Upendo Mmoja via Maria Mgova, Co-Founder and local Director/Operations Manager. See Upendo Mmoja's website at www.upendommoja.org. We know Nicole through our friendship with Pommern and common connections with Pommern leaders and service trips to Pommern. Our time at the Upendo Mmoja center was really fulfilling. Mostly it was the chance to get to know the children in their care and staff. During our visit we worked with two interns from Norwich University, Abby Joyal and Jake Apthorpe, who were there longer to prepare for a larger group of volunteers who came in August. We taught the children English and played with them-games like Netball and Duck Duck Goose. Some games are timeless! The staff include Director Maria Mgova, Cook/House Mother Neida (also called "mama"), Cook/Child Care Assistant Annette (also called as "auntee"), Doni (patron who takes care of the boys), Elina (Assistant Youth Leader) and Michael (security guard). They truly are a family as the children look out for one another as "siblings" and the staff are very caring and loving and teaching them many life skills so they may be independent as they mature. 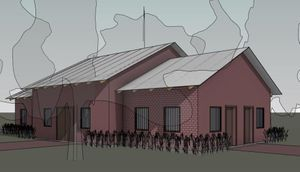 Upendo Mmoja is building a Residential and Vocational Center to care for the children currently under their care. The Residential and Vocational Center will also offer vocational training to adults as well as young people as they mature. It will include the main center which has sleeping rooms for the girls, a Boys Dormitory, a Carpentry and Craft Workshop and a sunflower oil processing plant. The main buildings of the Residential and Vocational Center, the kitchen and the barn are complete. We worked on the barn construction in July. The barn was completed in August. Several cows, pigs and chickens have been purchased and moved into the barn. The animals will allow the animal husbandry training to begin. Also, the animal husbandry program will generate income. Upendo Mmoja's goal after completion of the entire Residential and Vocational Center is to have sufficient income generated through the animal husbandry program, Carpentry and Craft Workshop and sunflower oil processing plant to be self-sufficient to support themselves and the children in their care. They are making great progress toward this goal by meeting their own milestones of constructing a major building each year which will create the entire Vocational Center campus. Upendo Mmoja is supported by local community members in Pommern and largely relies on donation form USA donors through a 501(c)(3) non-profit organization, Global Community Initiatives (GCI). GCI is basically the financial agent for Upendo Mmoja and sponsors it. See the Upendo Mmoja website at www.upendommoja.org and the GCI website at www.global-community.org. Donations are all accounted for with original receipts of expenditures and monthly reports from Upendo Mmoja's Director in Pommern. The local government also supports Upendo Mmoja goals by donating land to build the Residential and Vocational Center. The government granted one plot of land for the initial building and after seeing their progress, donated a second plot of land. It is expected that a third donation of land will be granted soon. These land donations allow Upendo Mmoja to not have to buy land but to use the monetary donations and resources towards construction of the buildings. The next project for Upendo Mmoja is constructing the Carpentry and Craft Workshop and then the Boys' Dormitory and perimeter fence. The USA Support Team will be raising funds for this next year and we will be helping with our own donations and spearheading a fundraising campaign in 2018. So stay tuned!! A picture is worth a 1,000 words. So we have posted many photos so you can see progress in Pommern and meet Upendo Mmoja members, staff and the children. See the 2017 Gallery. We hope you enjoy the photos!